In this change of era that we are living in, and in a city like Barcelona, many questions are arising and uncertainty is growing. Can science help us to settle our anxiety? Is scientific knowledge accessible to everyone? What are the limits of scientific progress? What dilemmas arise from the link between science, the market and the authorities? How can we ensure that everything invested publicly in science is useful for progress and social transformation?The city of Barcelona has become one of the most important centres of knowledge, research and scientific experimentation in Europe, and so it cannot remain indifferent to these concerns, or the discussions they generate. The City and Science Biennial is a broad look at scientific knowledge and citizens’ involvement. 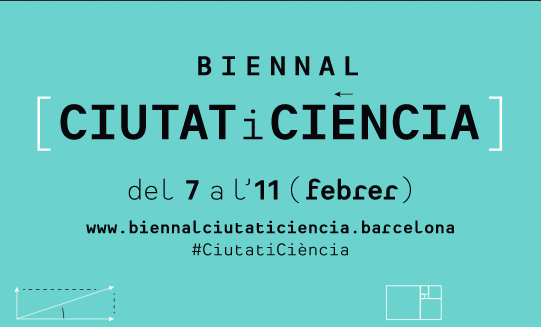 A Biennial with which the city’s academics, researchers, educators and scientists are collaborating, with the aim of reflecting openly on these issues with everyone who wishes to attend.The Biennial is open to everybody because science forms part of our everyday lives.Free activities at more than 60 venues, addressed to people of all ages in every district in the city.Over 80 workshops, discussions, exhibitions and shows in order to leave no questions unanswered. 50 days of reflection, because science has to be given space and time. Biennal Ciutat i Ciència from Barcelona Cultura on Vimeo. Anna May Masnou will be the moderator of the roundable "Chemistry and Health"
M. Rosa Palacín will participate in the debate "Towards a sustainalbe model of energy generation and use"